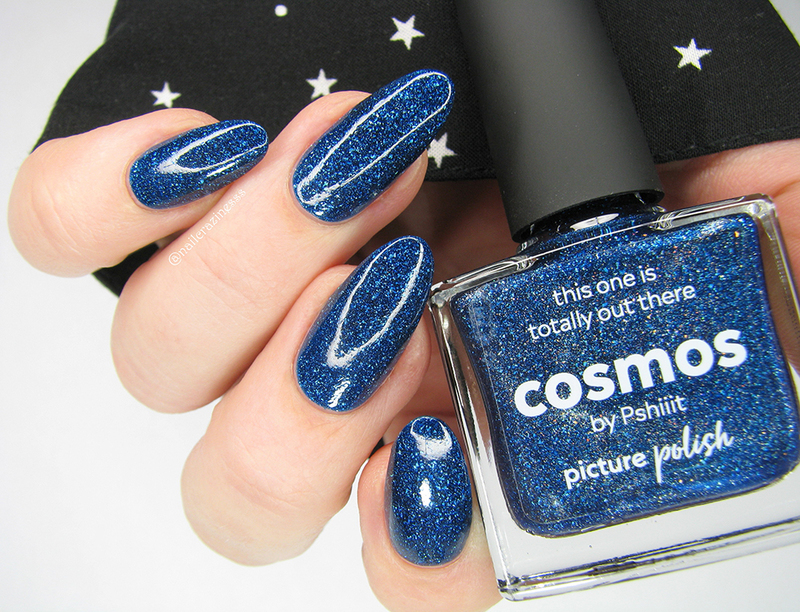 Today will be a cosmic post thanks to this beautiful nail polish, which was created in cooperation with Pshiiit (oh, her beautiful swatches!). Cosmos is a deep navy blue with the scattered holographic effect. Thanks to a jelly formula we get the incredible depth. But don’t let this jelly fool you – only 2 coats are needed for full opacity. The formula is smooth, dries in decent time and it shines beautifully (I do not have any top coat on in the pictures!). I had no problems with removing this nail polish with regular nail polish remover and cotton pads. Despite the dark color, Cosmos did’t stained my nails or cuticles. I guess I do not have to add anything more and let the pictures speak for themselves. So in love with this color, and let me tell you that nails painted with Cosmos looks … unearthly! Everyone should be tempted to own 11 ml of space closed in a rectangular glass bottle.